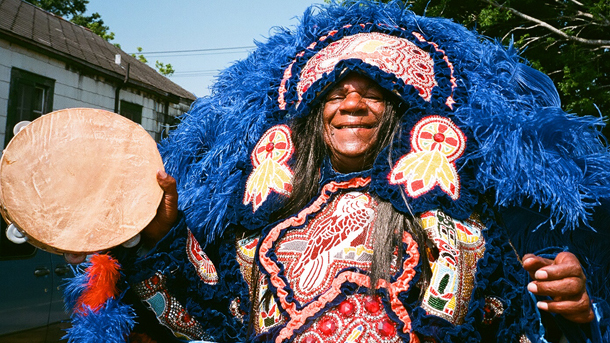 With dazzling costumes that reflect both African and Native American origins, and a funky, percussive sound that dares listeners not to dance, Mardi Gras Indians Big Chief Monk Boudreaux & the Golden Eagles bring revelry with a distinctively raucous New Orleans syncopation. Legendary Afro-Brazilian Carnaval champion Maracatu Nação Estrela Brilhante (“Bright Star Maracatu Nation”) is renowned for driving beats, vibrant call-and-response vocals, high-energy movement, intricate costumes, and elaborate street theater pageantry. A Tale of Two Nations brings traditional maracatu to the U.S. for the first time for an unprecedented collaboration with Scott Kettner’s New York-based Nation Beat, which blends maracatu with southern American musical traditions—New Orleans second line, funk, and country blues. See also July 30 and August 1 for additional A Tale of Two Nations–related events. A Tale of Two Nations is made possible through Southern Exposure: Performing Arts of Latin America, a program of Mid Atlantic Arts Foundation in partnership with the National Endowment for the Arts and the Robert Sterling Clark Foundation. A Tale of Two Nations would like to acknowledge American Airlines for its support.